Here in one disc are the three pieces for which William Byrd is most famous – his Masses for three, four and five voices. The fifth volume in the series is given over entirely to these superb works which are punctuated by some of the great master’s keyboard works exquisitely performed by Patrick Russill (the first time that an organ had been present in the Fitzalan Chapel in Arundel since the Reformation). The Mass for Three Voices is performed at a higher pitch thatn usual, giving it a light and airy scoring for soprano, alto and tenor which allows the wit and invention to shine through. 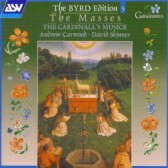 Whereas the Mass for Four Voices is sung with men’s voices, underlining its sombre character and sense of mysticism. The Mass for Five Voices completes this disc: powerful and deeply passionate, it contains one of the greatest pieces of polyphony ever composed in the setting of the words of the Credo.